The main developer of Cyberjaya, Setia Haruman Sdn Bhd, will invest RM2.5 billion over the next five years to develop four mixed residential projects here, which it dubbed "Intelligent City". 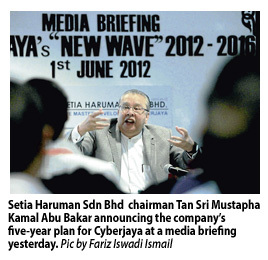 Its chairman Tan Sri Mustapha Kamal Abu Bakar said the projects - CBD Perdana 3 and 5, APEX Residence and a proposed mixed residential development - will be riding on the "new wave" development of Cyberjaya, slated to start from this year right up to 2016. Setia Haruman has also set aside RM400 million to build infrastructure such as roads and drains, water reservoirs, drainage systems, sewage treatment plants and fibre optic lines to service and support the "new wave" development. "The projects' gross development value is about 30 per cent more than the amount invested," Mustapha said during a media briefing here, yesterday. He said over the last three years, 16 major developers had acquired large tracts of land in Cyberjaya for residential, commercial and institutional developments. The other developers include UEM, OSK Group, Mah Sing and SP Setia. This "new wave" is expected to double the population here to 100,000 from the present 54,000. "Property prices have appreciated by 30 per cent over the last two years and early investors have enjoyed substantial gains.